What I'm wondering is where is the next generation? 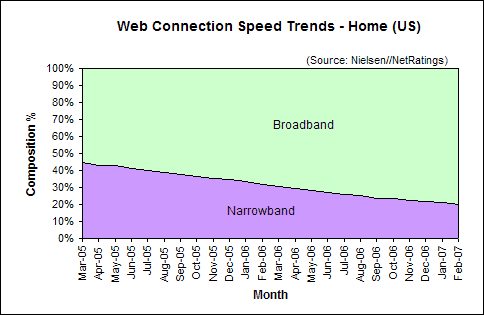 From looking at this graph, it is obvious that some next-generation high-speed connections are being lumped into the "Broadband" category. I'm guessing that fiber connections represent the next generation of broadband though ultrawideband and some other methods show similar connection speeds. What's the name for the next generation? "Ultrabroadband," perhaps? Or perhaps the next generation so next generation that it doesn't really even have a name yet. In any event, my guess is that it will be increasingly harder to shrink the 20% of narrowband subscribers -- eventually providers will stop offering dial-up as an option and force dial-up consumers into broadband, but at that point chances are good that the prices of low-speed broadband will be the same price as dial-up (I actually think that some DSL plans are there now). What is meaningful is that you can now make the general statement: "Most of the homes in the US have a broadband connection." In other words, broadband penetration in US homes is good enough to drive new (or previously not-conceived) bandwidth-intensive businesses and perhaps force existing businesses to reach consumers in a bandwidth-intenive way.